If you could put comfort in a bowl, you’d end up with matzo ball soup. Chicken soup is legendary. 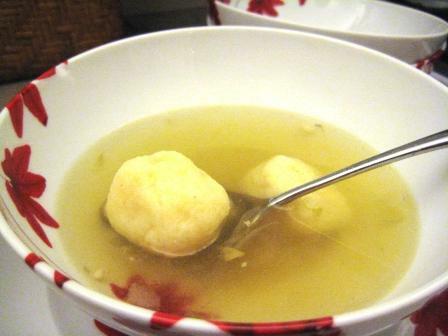 This “Jewish penicillin” can conquer the common cold and, if you believe your Bubbe, can cure any hurt or illness. Add fluffy matzo balls and it’s the stuff family legends are made of. 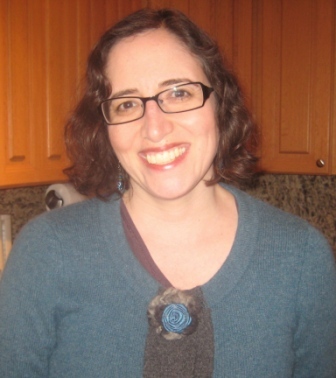 When our family first went gluten-free, we mourned the lack of matzo ball soup. Chicken soup with rice just wouldn’t suffice. I tried to make gluten-free matzo balls from scratch, but instead of matzo balls we ended up with matzo lumps. But when Passover rolled around, I found salvation. Salvation in a box. As Passover approaches, you can find several brands of gluten-free matzo meal. I buy four or five boxes to last well into the year. My favorite gluten-free matzo ball mixes are Paskesz Pesach Crumbs and Lieber’s Knaidel mix. (Paskesz’ gluten-free “Matzo Ball Mix” sounds like it would be great, but it produces knaidlach that are gummy instead of yummy.) Update: I’ve decided that Lieber’s Knaidel Mix makes the best gluten-free matzo balls. The recipe below follows the instructions for the Paskesz mix, so if using Lieber’s follow the directions on the box. You’ll end up with perfectly round cream-colored balls that are fluffy on the outside, yet ever-so-slightly dense at the core (which, in my opinion, is a good thing). We’ve served them to gluten-eating friends who’ve asked for seconds and thirds. To make the matzo balls, I use the recipe on the side of the box with just a few small changes. The recipe below uses Pesach Crumbs, because I can usually find those year-round in our kosher grocery store. Some matzo ball tips: After you’ve made the matzo ball mixture, be sure to refrigerate it for at least 30 minutes. Then enlist your kids to help roll the mixture into walnut-sized balls. However, be gentle: The more you roll the balls, the denser they will be. Set aside all the balls onto a plate. When they all are rolled and ready, drop the balls into a pot of boiling water, so they all cook for the same amount of time. Use a large pot, so the matzo balls have room to fluff up and not crowd their neighbors. In large bowl, beat eggs until blended. (I do this by hand, not in a mixer.) Mix in oil. Mix in water, salt and pepper. Add Pesach Crumbs and mix well. Boil 5 quarts of water and 1 teaspoon salt in a large pot. Take a teaspoon of matzo ball mixture and roll it between two hands into a ball slightly smaller than a walnut. Set aside on a plate, and repeat with remaining mixture. When all balls are ready, drop them into boiling water. Cook, uncovered, on low to medium heat for 25 minutes. Remove with slotted spoon. Place chicken in large soup pot and cover with cold water. Bring to a low boil and skim off the scum that rises to the top. (The scum contains some nutrition from the bones. But in my opinion, anything that’s called scum should be skimmed.) As soon as the soup boils, turn it down to a simmer. If you let the soup reach a rolling boil, the scum will reincorporate into the broth and you’ll end up with a cloudy broth. After you’ve skimmed the scum, add the onion, carrots, celery, parsnips, turnip, garlic, peppercorns, salt and bay leaves. Cover the pot, and simmer on low heat for three hours. To strain the soup, remove the larger pieces of chicken and vegetables and set aside. Then hold a fine mesh strainer over a large bowl. Slowly pour the soup into the strainer so any vegetables and chicken remain in the strainer, and the broth collects in the bowl below (you will need at least two bowls). Take your time and do it in batches, so you don’t spill any broth; it’s like liquid gold. 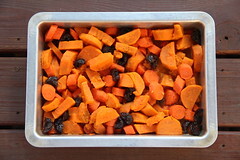 Separate the carrots and parsnips and refrigerate; discard the rest of the mushy vegetables or find a noble use for them. Remove the chicken pieces from bone and skin, discard bone and skin, and refrigerate chicken pieces. Refrigerate the broth separately in a bowl or glass jars. Refrigerate the broth overnight to give the fat a chance to congeal on top. Before serving, scrape off and discard the fat that has hardened at the top. (Don’t put the fat down your drain!) Reheat soup. Ladle hot soup into individual bowls, adding a carrot piece (and, optionally, a parsnip), chicken pieces and one or two matzo balls to each bowl. THANK YOU, THANK YOU, THANK YOU!! So great!! I just tryed a really great Gluten Free Matzo ball mix from a company called EenaKadeena.com. They were very simple to make , on my first try the came out perfect!! Pingback: Be Free For Me Blog » Blog Archive » Isn’t This Just Kosher? One holiday, I was making a hugh batch of chicken soup which I intended to freeze in large zip top bags. As I ladled the cooled soup into store brand plastic bags, leaks appeared in the bag and my “Liquid Gold” was sprinkling out all over the counter. I tried one more bag, and the same thing occured. To avoid my having a nervous breakdown, my husband ran out to the store and got me the most expensive brand bags he could find. What a mess!